The HD-TVI-PIR12 is a 1080P HD-TVI spy camera in a PIR motion detector housing with invisible infrared night vision. This is a full 1080p HD CCTV camera (AHD, HD-TVI, HDCVI formats supported) with a built-in audio surveillance microphone. The 940nm IR LEDs are hidden behind the PIR sensor window which makes this camera completely covert even when the IR LEDs are on. 940nm LEDs do not emit a red glow like traditional infrared cameras. The 3.7mm fixed pinhole lens provides a wide angle of view that is ideal for most applications. It captures a field of view of about 90 degrees. Check out these 1080p surveillance photos captured using the HD-TVI-PIR12. You can also watch this demo video and hear a demo of the built-in audio surveillance mic here. Important Update! The HD-TVI-PIR12 is now a 4-in-1 selectable format camera. The following video formats are selectable using the OSD joystick that is attached to the camera's video cable. The built-in microphone is optional to use. Simply connect the RCA output of the mic to an audio input on your DVR to capture audio- surveillance. High definition video and audio can be recorded together using an AHD compatible DVR such as the latest iDVR-PRO HD CCTV DVRs. HD iDVR-PROs support traditional analog CCTV cameras as well as the latest 720p and 1080p AHD cameras. When the HD-TVI-PIR12 is connected to an iDVR-PRO, users can also login to view their camera from iPhone and Android mobile devices. This camera is an excellent choice for indoor hidden spy camera applications that require full 1080p high definition video. This camera can capture video in normal, low light and zero light conditions. The gimbal wall mount bracket provides installers flexibility to angle this camera in all directions. 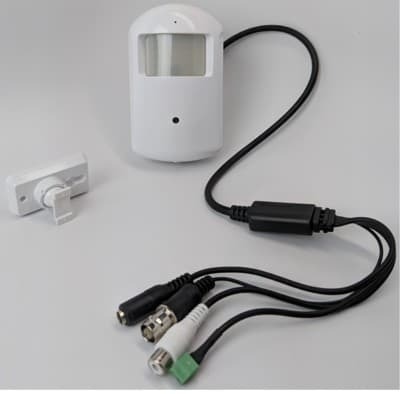 Installers can use the same RG-59 or RG6 coaxial cable that is used for analog CCTV cameras to run video from this camera to a DVR. RG59 or RG6 can also be used to run audio. The 24 IR LEDs can illuminate up to 32 feet and the built-in on-screen display lets installers adjust advanced features such as wide dynamic range (WDR), SENS-UP, shutter speed, and 3D digital noise reduction. IMPORTANT NOTE: TVI cameras are compatible only with TVI CCTV DVRs. The 940nm IR LEDs (invisible infrared) of the HD-TVI-PIR12 are hidden behind the PIR window of the motion detector housing. This makes this HD spy camera completely undetectable. The small black circle that you can see below the infrared LEDs is the 3.7mm pinhole camera which naturally looks like part of the motion detector device that this camera is designed to look like. These features make the HD-TVI-PIR12 the best choice for hidden spy surveillance in high definition. The above video was captured by connecting an HD-TVI-PIR12 to an iDVR-PRO8M hybrid HD CCTV DVR using RG59 coaxial cable. Please select 1080p video resolution in the lower right of the YouTube video player and watch in full-screen mode to see the best quality video. Watch the above video to hear a sample of audio surveillance captured using the HD-TVI-PIR12's built-in surveillance microphone. The above image was captured using the HD-TVI-PIR12. All of the lights are on in the room so that the camera is operating in daytime / color mode. This image was also captured using the HD-TVI-PIR12 in the same room, however, this was recorded with all of the lights turned off in the room. You can see that the 940nm invisible IR LEDs illuminate this entire room. Although the picture is not quite as clear as a traditional IR camera, this is a trade-off for the covert IR that you get with a 940nm IR camera. When the HD-TVI-PIR12 is connected to an iDVR-PRO HD DVR, users can log in from remotely over the Internet to view the camera live. To capture these mobile screenshots, we connected our HD-TVI-PIR12 to an iDVR-PRO16M DVR. Check out the below images to see this camera being viewed using the iDVR-PRO Viewer app for iPhone. Above is the remote view in normal light conditions. This image shows the remote iPhone view with all of the lights off and the camera's invisible infrared night vision mode engaged. These images were captured while using the iDVR-PRO Viewer mobile app for Android. The camera is still connected to the iDVR-PRO16M at our office and we are accessing the DVR using WIFI on our demo network. This works the same as viewing the camera from remotely over the Internet. Here is the infrared view from the Android app. The below image shows the cable leads and connectors that are used to install the HD-TVI-PIR12. You can also see the gimbal bracket mount. DC Power Input - this camera includes a 12V DC power supply that connects to this input. The power connector on premade RG59 Siamese cables can also be plugged in or a PT-3 power cable lead if you are using a spool of RG59 Siamese cable. Audio Output (RCA) - if you want to capture audio, connect this RCA output to the audio input of your DVR. You can use RG59 coaxial cable if you plan on using the built-in audio mic. TVI Video Output (BNC) - this is the TVI video output that you connect to your TVI DVR. 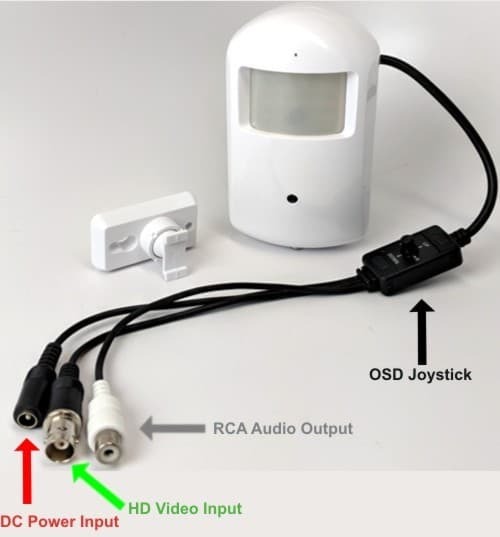 OSD Joystick Input - the OSD joystick that is included with this camera allows the installer to fine tune the software settings of the camera. For most installations, the factory default settings work best and this does not need to be adjusted. The HD-TVI-PIR12 is simple to install. 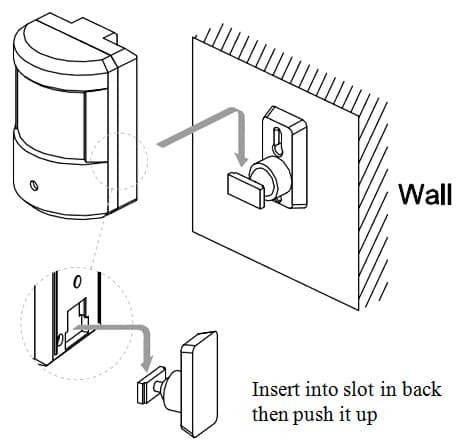 The wall mount bracket attaches with two screws and the PIR camera simply slides on to the wall bracket. The installer can then adjust the angle of the camera in any direction because of the gimble mount. Installers can easily select the video mode using the small joystick that is attached to the camera's video cable. Simply hold the joystick in any direction for 5 seconds to switch to that video mode. Download the HD-TVI-PIR12 product specification here. This hidden PIR camera is also available in an analog CCTV version, the PIR-IR60. It comes in the same exact PIR sensor body as the HD-TVI-PIR12 and uses the same invisible IR LEDs. The difference is that is designed for CCTV DVRs (not TVI ) and supports 960H resolution (960 x 480), not 1080P resolution (1920 x 1080). The HD-TVI-PIR12 works great with an iDVR-PRO hybrid surveillance DVR. iDVR-PRO hybrids support analog CCTV and TVI CCTV cameras (1080p). Users can mix and match different camera technologies. This is perfect for customers that have existing CCTV cameras and want to upgrade to high definition over time. Hybrid iDVR-PROs work with the following security camera types and resolutions. Want to see how live video on this camera looks remotely over the Internet, please request a demo login below. You will be able to log in from iPhone, iPad, and Android mobile devices. You can also log in from Macintosh and Windows computers. Please note that not all applications stream HD video. Mobile apps stream a lower resolution so that performance is better. Please click here to request a demo login.